Hurrah! ‘Tis finally the season for all things Beer Garden! 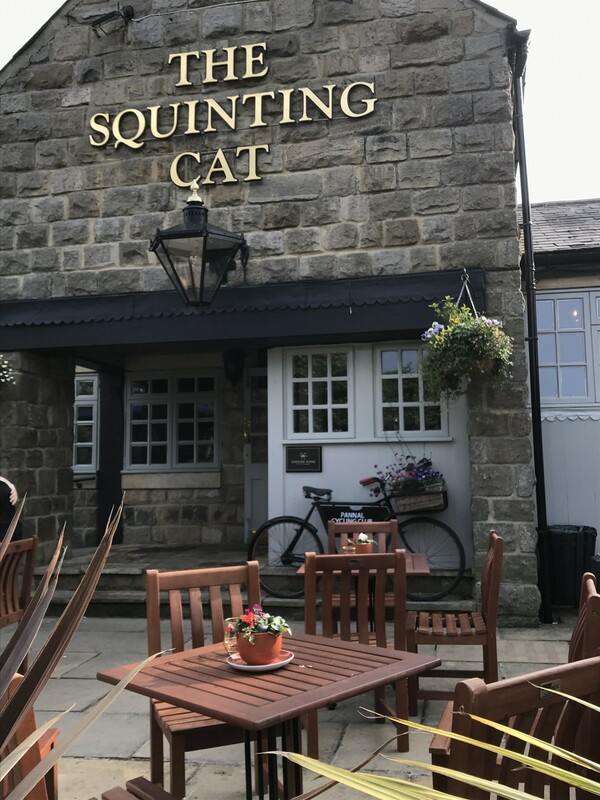 We were really pleasantly surprised when we visited the Squinting Cat in Harrogate recently for a bite to eat and some beer garden loveliness. The Squinting Cat has had a big refurb, upped its food game massively! Way back when, the Squinting Cat was a REALLY nice pub, it even had it’s own Heli-pad in the car park and everything! I know! 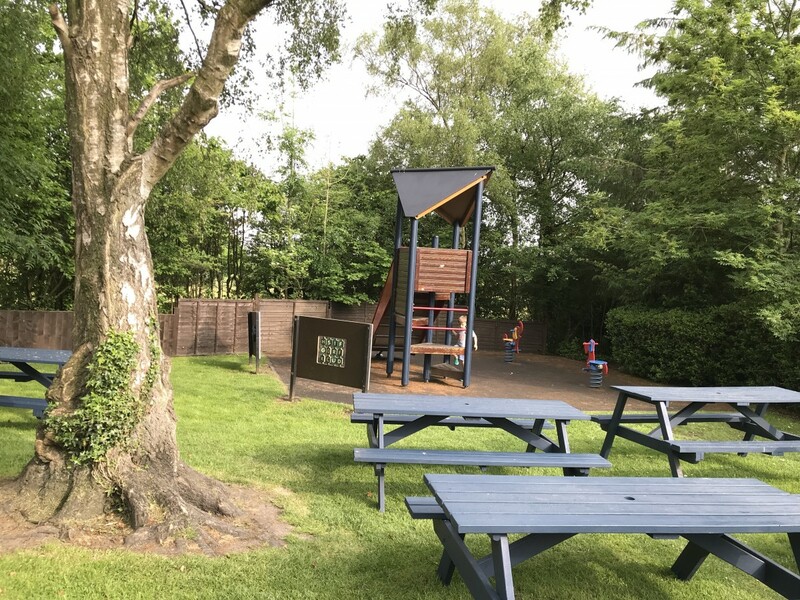 We visited on a glorious Friday evening, which meant we could sit outside in their beer garden, complete with big play slide and a grassed area for the Smalls to play on! 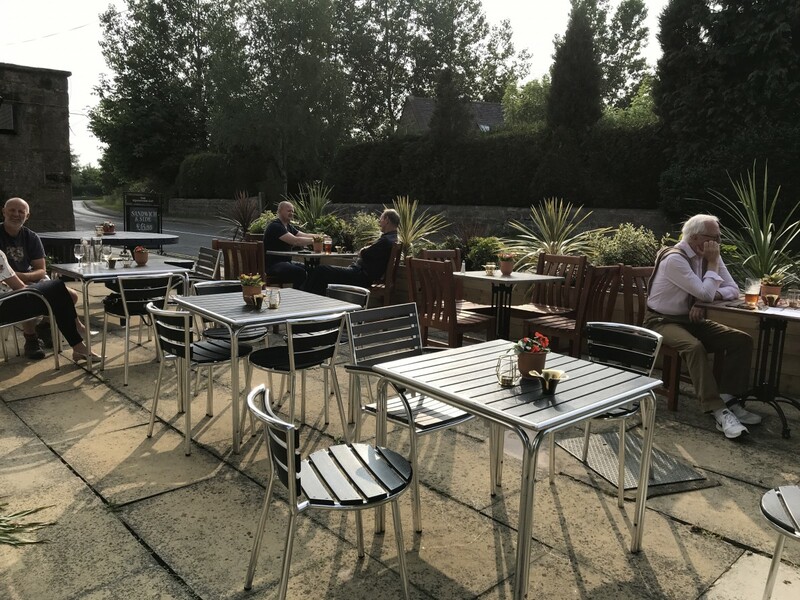 They also have a separate, more ‘grown-up’ friendly, area around the side, compete with flower pots and in the full evening sun – which Harrogate Papa and I coveted as we were steered by the Smalls towards the more family friendly tables at the back. 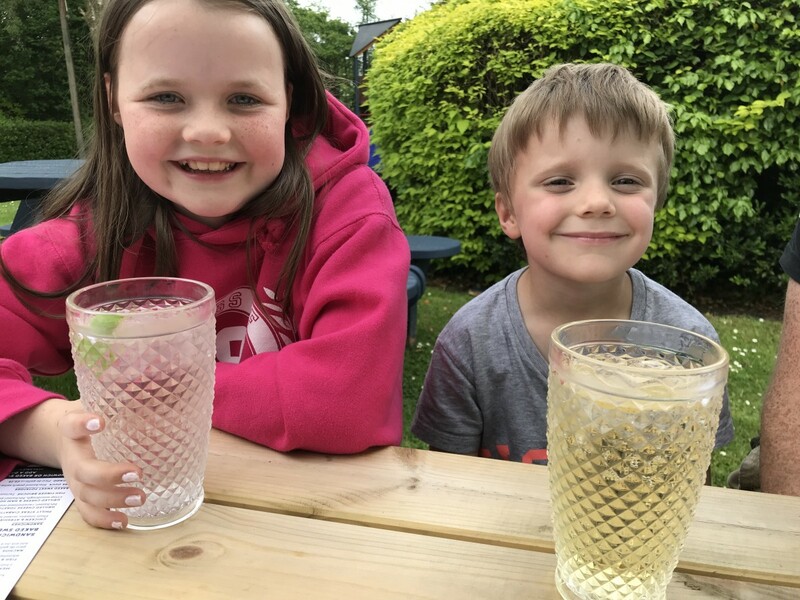 The Smalls were over the moon with soft drinks and outdoor play, while we perused the menu and were really pleased with the food choices available. We shared a few starters over our pint of Peroni and drinks. Halloumi and bread and olives, which the Smalls delighted in and we all demolished quite quickly. 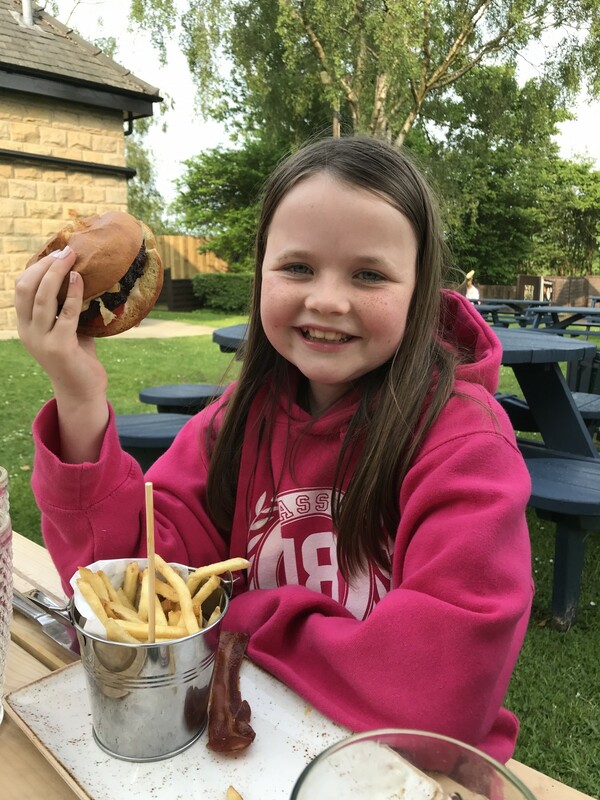 Burgers seemed to be the order of the day for our main courses. 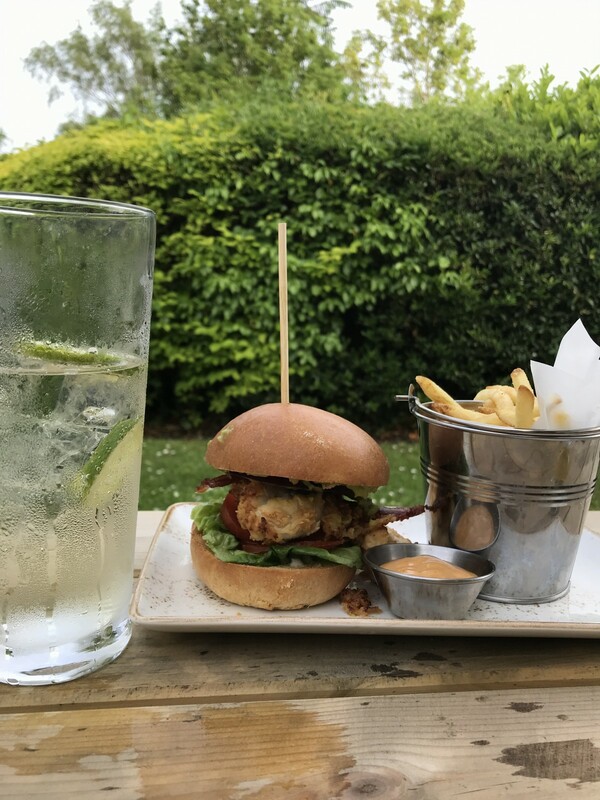 One of the Big Girls’ ordered the Prime Steak Burger, Harrogate Papa the Buttermilk Fried Chicken Burger and I went for the veggie Falafel Burger. 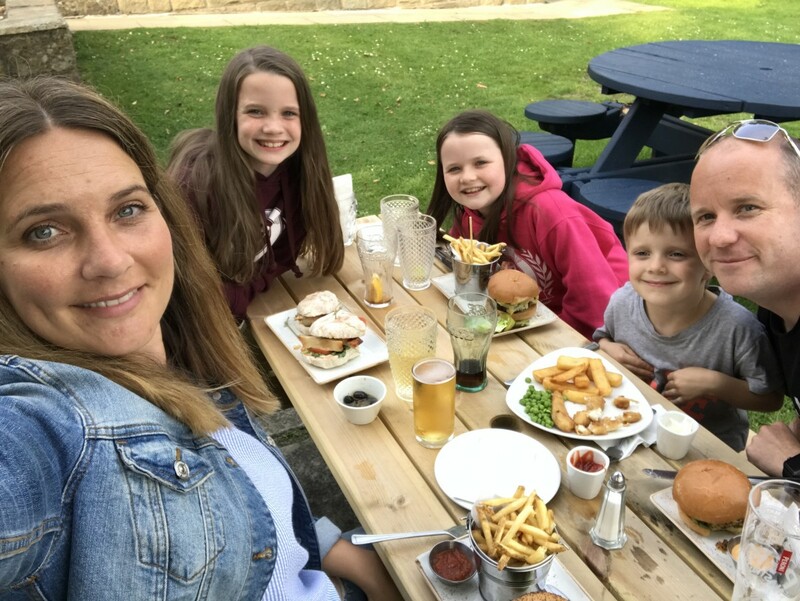 The Small Boy chose fish and chips from the kids menu – for just £3.95 and the other Big Girl went for the Chicken and Ayrshire dry-cured bacon sandwich on ciabatta. The grown-ups burgers were all around £10 each and the sandwich £6.50. 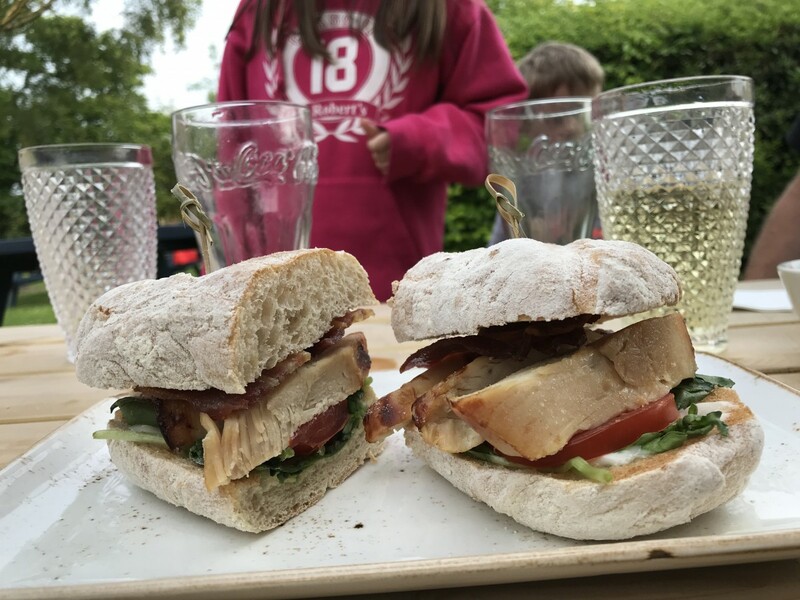 We were all really impressed with the food, the chicken burger went down really well with Harrogate Papa, and the brioche bread it was served in was perfect too. 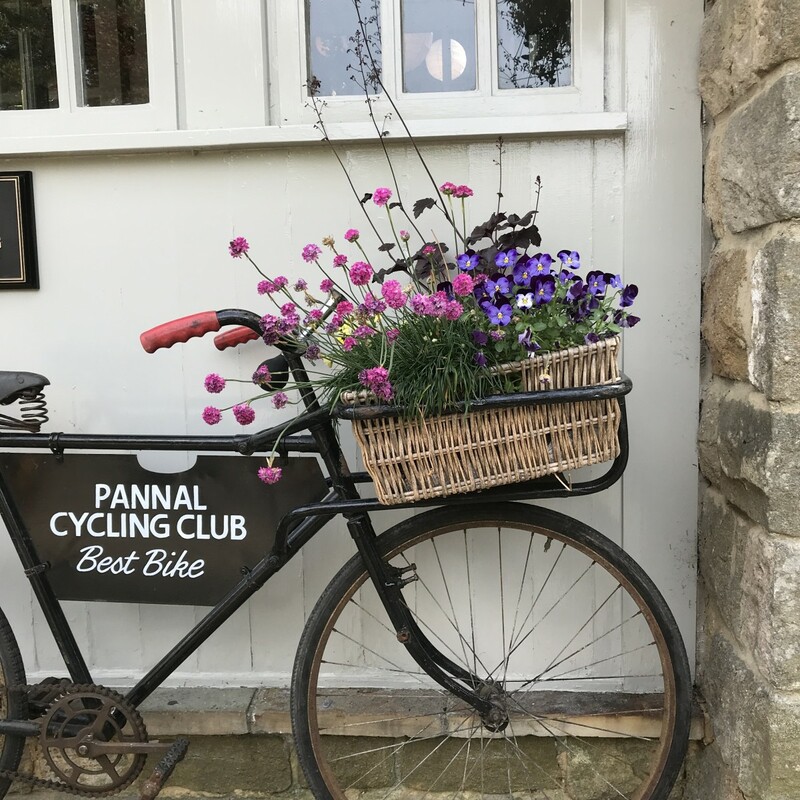 The chips were all hot and crispy and the Ciabatta sandwich was polished off in no time! 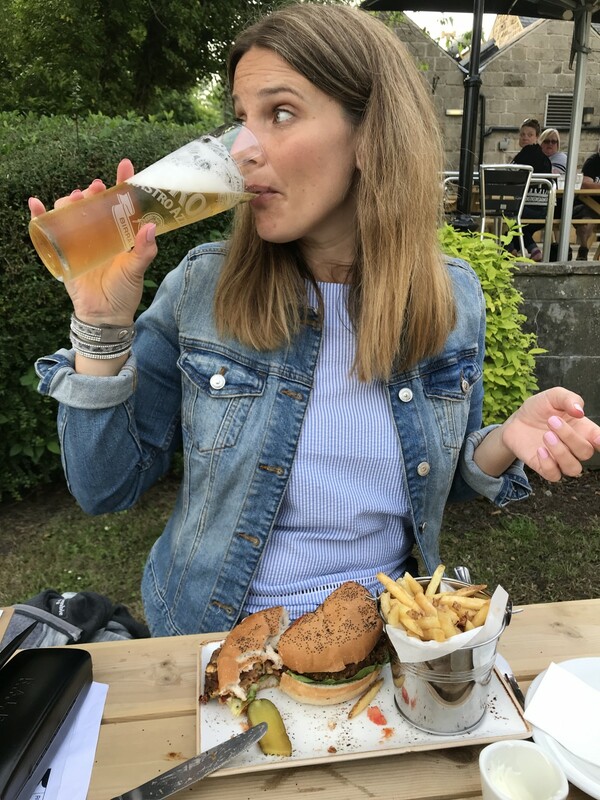 I loved the falafel burger in its poppy seed bun, it was really tasty and I’d happily order it again! There wasn’t much room left for pudding, but when did that stop anyone! Ha! The Small Boy had mint choc chip ice-cream, his very favourite, for just £1.45. 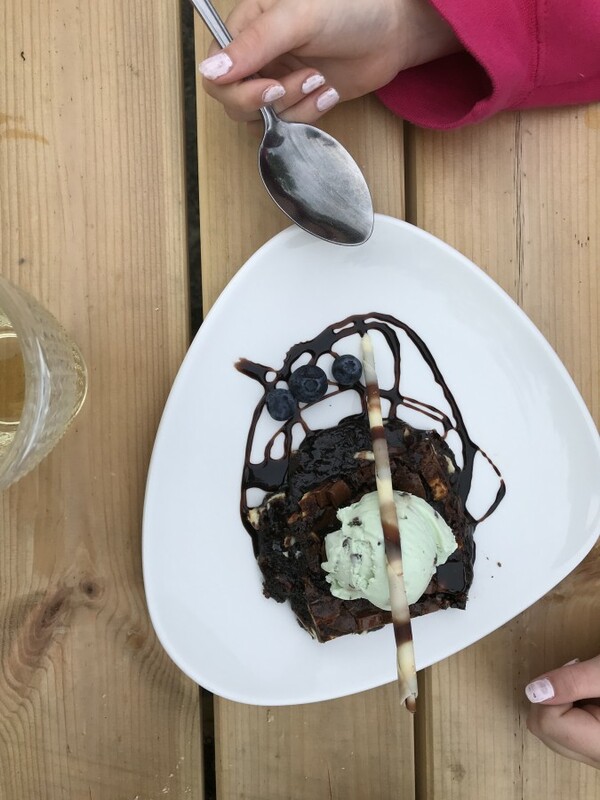 The Big Girls went for the classic Sticky Toffee Pudding and Triple Chocolate Chip brownie, which went down a storm, but they probably should have shared as the portions were so generous! I opted for the seasonal crumble, gooseberry, served with clotted cream ice cream, which was good but even I was over-faced! 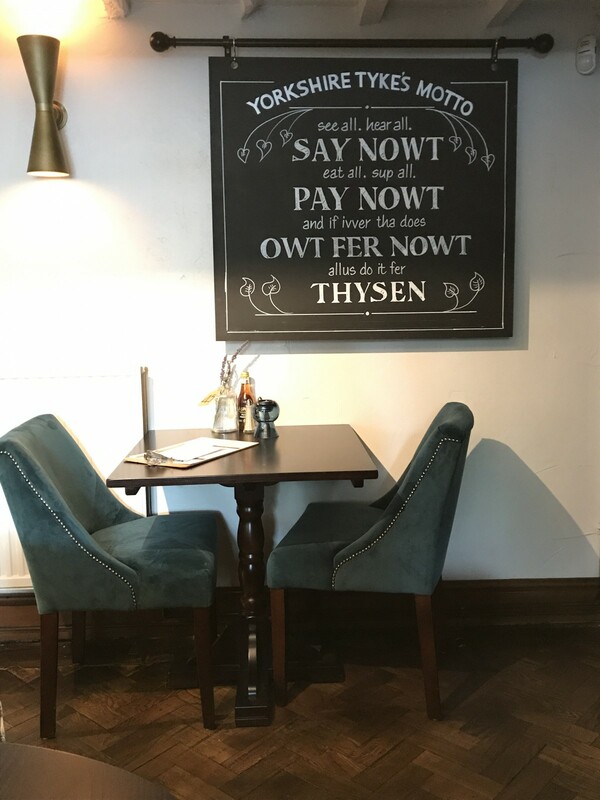 The inside space at the bar had been updated too, and there were some really lovely touches, it’s a really big space inside and they’ve done really well to divide it up to create more atmosphere. 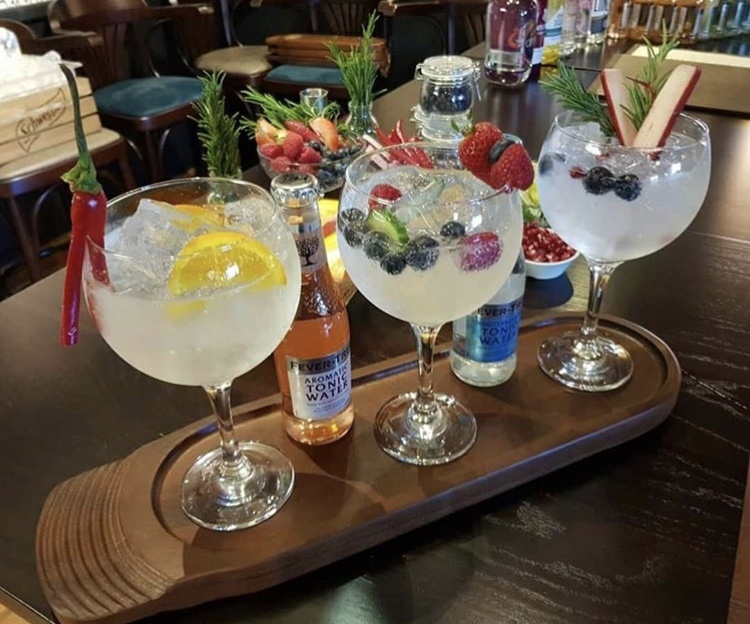 The bar was stocked with a wealth of local spirits including loads of Yorkshire Gins, which also means they can do a cracking offer of three spirits and two fever tree mixers for just £12 – I’m going to go back to try these for sure! 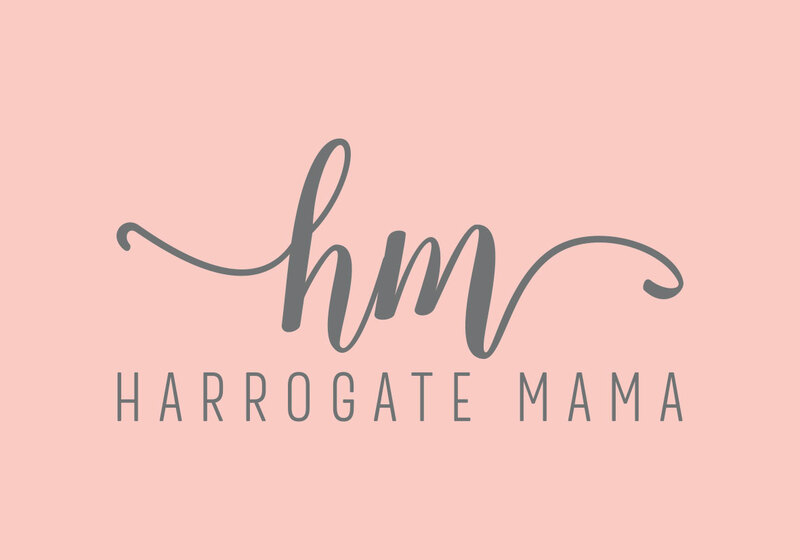 All in all we had a lovely time at the Squinting Cat, the food really impressed us, the service was absolutely top notch, much better than we’ve had at other restarurants and bars in Harrogate recently, and the refurbishment was also really nicely done! We’re looking forward to heading back before too long!